Seat CEO Luca de Meo points to a Waze logo on the side of one of the automaker's SUVs. Volkswagen Group's Seat brand will make Waze's navigation system available on its entire range in the coming weeks. Waze, formerly FreeMap Israel, is a navigation app developed by the Israeli company Waze Mobile and acquired by Google in 2013 for a reported $1.2 billion. The Waze app works on all major smartphone operating systems and has a large community of users who share information on real time traffic conditions, the latter also used by Google Maps. 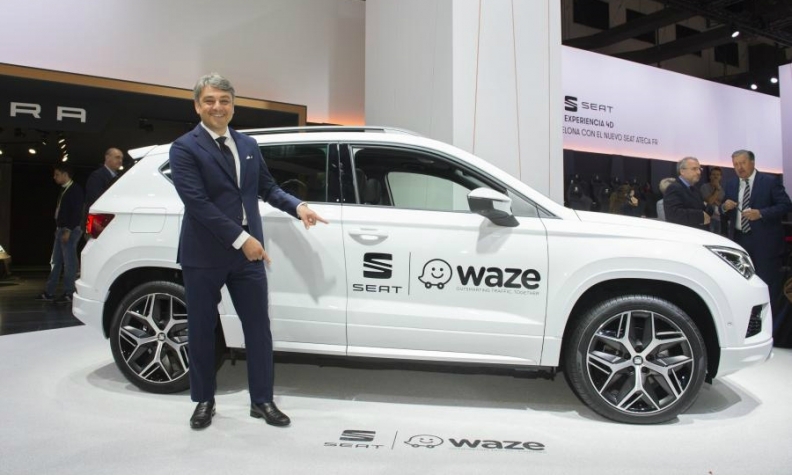 "Incorporating the new Waze app in our vehicles is in line with our goal of offering a driving experience that is easy, connected and personalized, and one which enables us to continue to make progress in configuring our digital ecosystem," Seat CEO Luca de Meo said in a statement. Google plans to launch a beta version of the Waze app for Android that will be compatible with all Seat cars that are equipped with Full Link multimedia interface, including models already delivered to customers. Seat also unveiled its new Seat Drive App for Android Auto. With it, drivers with Android phones running version 5.0 Lollipop or newer, can safely access information from their phone on the screen of their car while driving. The app, which will be available soon on Google Play Store, will synchronize with the car and display information on its screen. With this app for Android and the Apple iOS version launched last year, Seat said that more than 95 percent of smartphone users can keep track of the status of their vehicle the last time it was synchronized. Easy and effective smartphone integration is crucial for Seat, as the brand claims to have the youngest customer base in Europe. At about 43 years old, it is 8 to 10 years younger than other brands, de Meo said.